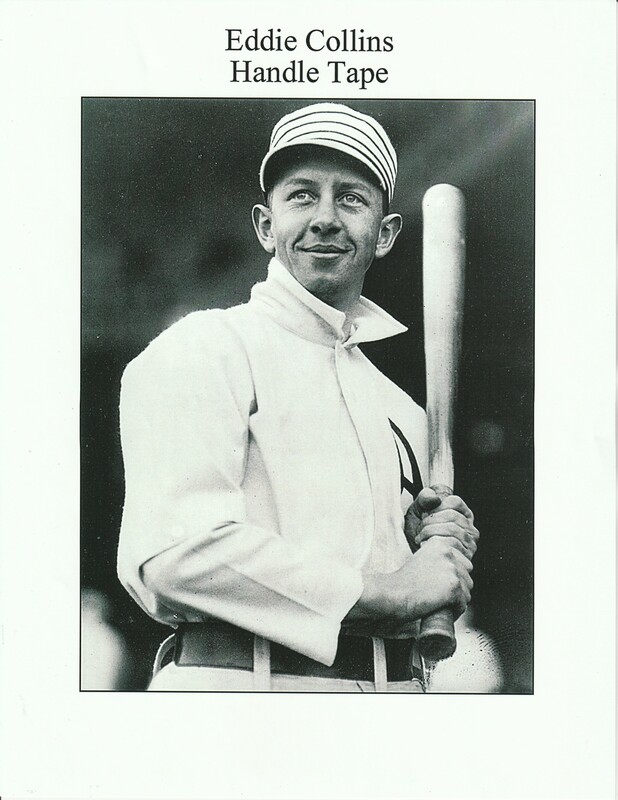 Eddie Collins burst into the American League in 1906 after a recorded of both academic and athletic excellence at Columbia University. Collins’ refined and educated manner immediately set him apart from the average ballplayer of his day while his bat and play at second base further pushed him ahead of the pack and made him a star. Playing for Connie Mack’s Athletics, Collins was one of the leaders of the A’s team that won four straight pennants and three World Championships. After winning the World Series with the A’s in 1914, Collins was traded to the Chicago White Sox. He quickly established himself as a team leader and the White Sox won the World Series in 1917. Despite being a supremely talented ball club, the White Sox were a heavily divided team. Half of the players looked to Eddie Collins for guidance while a disenfranchised group looked to ex-prizefighter and career troublemaker Chick Gandill. This schism led to the Gandill-led group throwing the 1919 World Series. Collins and his crew emerged from the scandal clean, and Eddie went on to become only the 6th player in history to reach the 3,000 hit mark and was among the first group of players elected to the Hall of Fame when it opened in 1939. This Hall of Fame-worthy gamer was used by Eddie Collins at some point during the 1914-1915 seasons. Always trying to improve their product, September 1914 saw J.F. Hillerich & Son introducing their new “Kork” grip bats. Several models were available to the public, and sample versions of the 40K “Kork” grip sent to the most prominent endorsers of the company’s bats. A 1916-17 era photograph of Honus Wagner shows him using one of these “Kork” grub bats and over the years, PSA/DNA has authenticated circa 1914-1915 “Kork” grip game used bats attributed to Wagner, Nap Lajoie, Frank Baker and Eddie Collins. Based on the C-2A center brand-style stamping and the “Kork” grip, PSA/DNA has narrowed manufacturing period of the bat from September 15, 1914 through the 1915 season. The bat’s specs match Hillerich & Bradsby records as being Collins’ “His Old #1” model, later given the designation of “R139.” Though none of Collins’ order records survived pre-1920, the 34” length and 38oz weight match a circa 1910 game used Collins bat previously examined by PSA/DNA. 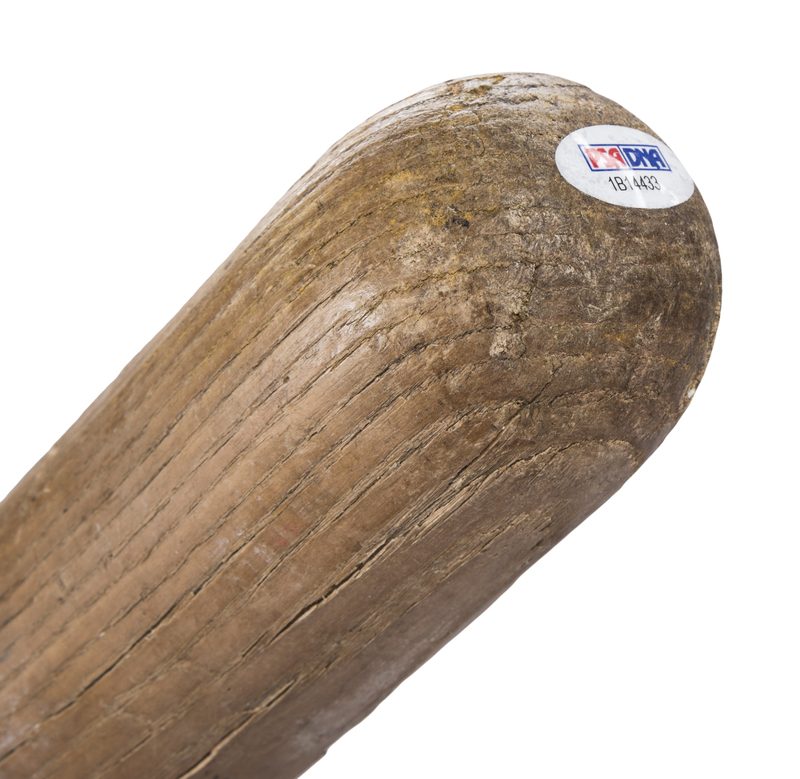 Condition-wise, Collins’ Hillerich & Bradsby C139 model bat exhibits outstanding game use with a handle crack and a chip on the knob. Repeated ball contact has caused some checking on the back barrel and many ball marks are found right, left and back barrel. The original “Kork” grip originally fabricated on the handle is no long present, replaced with a spiral pattern of black electrician’s tape, half of which has been removed. 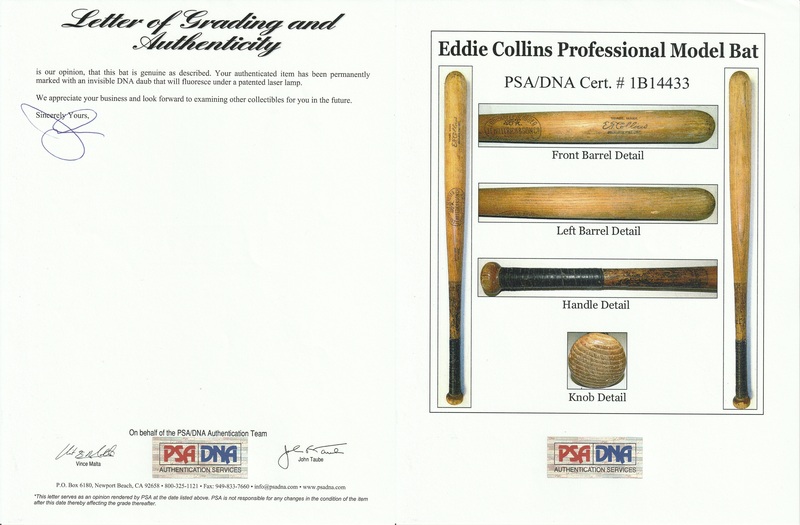 This style of taping a bat’s handle is a player trait of Eddie Collins (a photograph of him posing with just such a bat is included in the PSA/DNA LOA), though PSA/DNA was not able to determine if the tape was added by the player to enhance the grip or added later to secure the handle crack. Initial’s interpreted as “W.S. 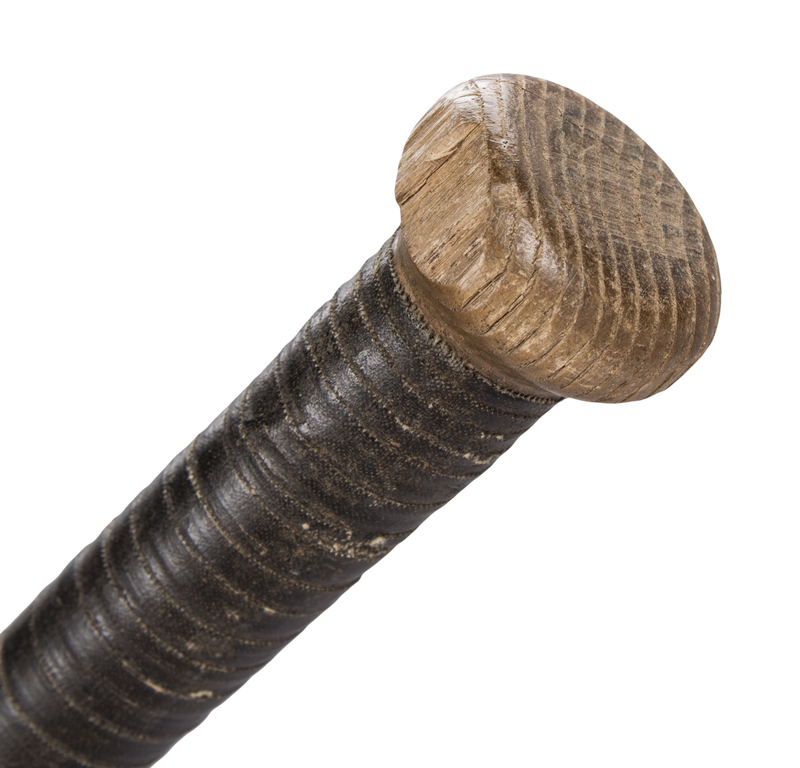 1” has been burned into the bat’s center brand above the “40K.” It is no understatement to say that pre-WWI game used bats attributed to Hall of Famers are scarce - to find one from a star the caliber of Eddie Collins who was in the prime of his career is a real find. This bat comes with a LOA from PSA/DNA (1B14433) for the game use and has been graded a GU 7.5.